This is the new Public foot bridge in Libis just few meters away from the flyover. It was requested by Citizens patrol few years back and built early this year if I'm not mistaken. My former office is just beside this bridge and for 6 years working in that place I endured crossing the street praying that vehicles would not hit me. It was a very dangerous road in Libis because pedestrian crossing is just a few meters where vehicles rush coming down from the high flyover. I resigned from my job a year ago and it was months after that I saw this bridge being completed. When I visited my office early this year I was excited to see my dream bridge and took a photo. You'll notice that it's really quite new with all the paint still in good shades. For more of 'public' themed photos just click the badge above! i am not sure if this is the same overpass i walked across C5 to go to Mercury Drug. i don't think i'd be able to cross C5 without a footbridge--too scary! Hi Luna, are you referring to Mercury Drug corporation or store. 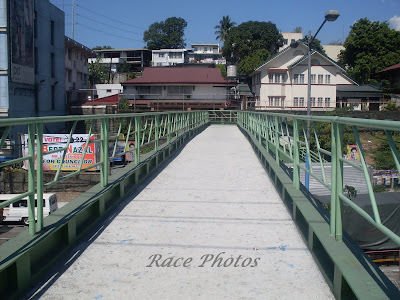 This foot bridge is just across Mercury Ave. where Mercury Drug head office is located, there's another one in Citibank across Mercury Drug store. Both are scary to pass without a footbridge! what a great looking shot! Great take on this weeks theme. I always like the look of traffic and people from bridges.